For other uses, see Wyvern (disambiguation). A wyvern (/ˈwaɪvərn/ WY-vərn, sometimes spelled wivern) is a biped legendary creature with a dragon's head and wings, a reptilian body, two legs, and a tail often ending in a diamond- or arrow-shaped tip. A sea-dwelling variant dubbed the sea-wyvern has a fish tail in place of a barbed dragon's tail. A golden wyvern is believed to have been the symbol of the medieval kingdom of Wessex. The design of the wyvern is thought[by whom?] to have derived from the figure of the dragon encountered by Trajan's legions in Dacia. It may be the origin of the red dragon of Wales and the golden dragon of the Kingdom of Wessex carried at the Battle of Burford in AD 752. The concept of winged snakes is common in cultures around the Mediterranean, with a notable example being the Egyptian goddess Wadjet. The oldest creatures outright referred to as "winged dragons" are Helios's chariot steeds, which aid Medea. Wyverns are very similar to dragons, and in many languages, cultures and contexts no clear distinction is made between the two. Since the sixteenth century, in English, Scottish, and Irish heraldry, the key difference has been that a wyvern has two legs, whereas a dragon has four. However, this distinction is not commonly observed in the heraldry of other European countries, where two-legged dragon-like creatures being called dragons is entirely acceptable. In the modern fantasy genre, there is little differentiation between dragons and wyverns, with two-legged, magical reptilian creatures all likely to be referred to as "dragons" without any differentiation between types. Wyverns, when present as creatures distinct from dragons, tend to appear as less magical and more as dangerous beasts smaller, weaker, and less intelligent than dragons. While a fantasy dragon often has a breath weapon, such as fire, wyverns rarely have such abilities and are more feared for their ferocity and sharp teeth and claws. Wyverns are sometimes associated with poison, either in the form of venomous fangs or poisonous breath, but this trait is not universally represented and may be a more recent addition to the lore based on the gila monster. A wyvern will typically be unable to speak, while a dragon often does have that ability. The wyvern features frequently in modern fantasy fiction, though its first literary appearances may have been in medieval bestiaries. The wyvern is a frequent charge in English heraldry and vexillology, also occasionally appearing as a supporter or crest. A white (Argent) wyvern formed the crest of the Borough of Leicester as recorded at the heraldic visitation of Leicestershire in 1619: "A wyvern sans legs argent strewed with wounds gules, wings expanded ermine." The term "sans legs" may not imply that the wyvern was "without legs", rather that its legs are not depicted, being hidden or folded under. This was adopted by the Midland Railway in 1845, when it became the crest of its unofficial coat of arms. The company asserted that the "wyvern was the standard of the Kingdom of Mercia", and that it was "a quartering in the town arms of Leicester". However, in 1897 the Railway Magazine noted that there appeared "to be no foundation that the wyvern was associated with the Kingdom of Mercia". A green Wyvern stands in the emblem of the ancient and historical umbrian city of Terni, the dragon is called by the citizens with the name of Thyrus. Sable wyvern on a white background with endorsed wings forms the coat of arms of the Tilley family. The kings of Aragon of the House of Barcelona since Peter IV used a wyvern as a crest on their helmets. Nowadays this symbol has been officially adopted as the coat of arms of the Generalitat Valenciana (Valencian Parliament and Government). The arms of the Worshipful Society of Apothecaries depict a wyvern, symbolising disease, being overcome by Apollo, symbolising medicine. The wyvern is also a fairly popular commercial logo or mascot, especially in Wales and what was once the West Country Kingdom of Wessex, but also farther afield in Herefordshire and Worcestershire, as the rivers Wye and Severn run through Hereford and Worcester respectively. A local radio station was formerly called Wyvern FM. Vauxhall Motors had a model in its range in the 1950s called the Wyvern. The Westland Wyvern was a British single-seat carrier-based multi-role strike aircraft built by Westland Aircraft that served in the 1950s, seeing active service in the 1956 Suez Crisis. The wyvern is also the mascot of the 51st Operations Support Squadron at Osan Air Base, with the motto: "breathin' fire!" A wyvern is depicted on the unit crest of the USAF 31st Fighter Wing. The wyvern is the mascot on the shirt of Leyton Orient F.C.. The wyvern is featured as the team mascot for Woodbridge College in Woodbridge, Ontario, Canada. The wyvern is the mascot of Quinsigamond Community College in Worcester, Massachusetts. The wyvern is the logo of Gore Court Hockey Club. 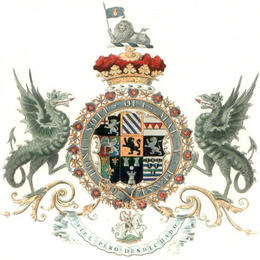 The arms of Catherine of Braganza, Queen consort of England, Scotland and Ireland and princess of Portugal, combines as supporters the wyvern vert of Portugal and the crowned lion of England. US Army 3rd Infantry Division has a wyvern on its coat of arms. The insignia is worn as a unit crest by members of the division's command. ^ a b Hoad, T. F. (1993). English Etymology. Oxford: Oxford University Press. p. 546. ISBN 0-19-283098-8. ^ a b c d Sayers, William. "The Wyvern". Neuphilologische Mitteilungen 109.4 (2008): 457-465. ^ "Flags in the Bayeux Tapestry". Encyclopædia Romana. ^ Dennys, Rodney (1975). The Heraldic Imagination. New York: Clarkson N. Potter. pp. 186–8. ISBN 0517526298. ^ A wyvern and an elephant may be found at Harley MS 3244 (dated 13th century, after c. 1236), f.39v. ^ "51ST OPERATIONS SUPPORT SQUADRON > Osan Air Base > Display". www.osan.af.mil.